Buy great fresh food at Coles supermarket this week. You can shop for new season's products like apples. 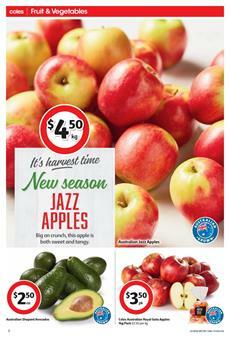 Australia jazz apples will cost only $4.50/kg. Deli-meat sale of the Coles store covers nice products like Don honey leg ham. Buy Lilydale free range whole chicken will cost only $5.50! Browse the half-price sale of Balconi cake mix max 10 pack. Its price is only $2.75 with this product. Have a pack of your soda at lower prices. Red Bull, Pepsi Max, Golden Circle, Powerade, and more are in the range of soft beverage. Purchase Coca-Cola soft drink 24x375mL for only $18! Pantry sale of the Coles has a lot of half prices. Turkish delight, Cheezels, La Espanola olive oil, and Heinz Beanz cans are at half prices. A fine selection of the ingredients that will be in your meal. Coles Catalogue shows the prices of products like diced tomatoes, corn kernels, and many more products that can be in your stocks of the pantry. Red Seal hot or cold brew tea bags will cost $2.25! If those deals draw your attention then dairy-pantry range can also be interesting to you. Chobani flip yoghurt will cost only $2! Renew your list of shopping for the packaged foods after you see the half-price sale on pg 24-25.